Fresh reports that Apple is prepping a launch of a 7- or 8-inch version of its iPad have surfaced once again. Claims from the Bloomberg news agency come about a week after Google launched a $200 7-inch tablet, the Nexus 7. Apple's smaller iPad, nicknamed "the iPad Mini" by Apple watchers, will purportedly launch in October and sell for around $200 just like Google's new device and Amazon's Kindle Fire. To help it hit that low price, the purported iPad Mini would come without the current iPad's popular high definition Retina display, according to Bloomberg. It's not clear if the rumored iPad Mini will lack any other hardware features of the standard iPad such as an LTE radio or front- and rear-facing cameras. It's also unknown whether a smaller iPad might have less storage, say 8GB, compared to the 16GB, 32GB, and 64GB versions of the current iPad. Several months ago the idea of Apple launching an iPad Mini seemed unlikely. But that was before Google released the Nexus 7 and Microsoft announced its own brand of Windows 8-based tablets called Surface set to hit store shelves later in 2012. Apple is still the market leader for tablets by a mile. But with new tablets coming from Apple's main rivals and a trend toward offering bargain basement tablets Apple may be feeling the pressure to answer the competition. In addition to the Nexus 7 and Kindle Fire, other cheap tablets include Lenovo's Android-based IdeaPad A1, Barnes & Noble's Nook tablet, and even the 16GB BlackBerry PlayBook. An iPad Mini may be a popular choice for many people. A recent survey of more than 2000 online consumers by PriceGrabber found that 52 percent of those surveyed said they would look at buying an iPad Mini. But Apple has said publicly that 7-inch tablets are a bad idea. In late 2010 then-CEO Steve Jobs said 7-inch screen sizes were not sufficiently large enough to build great tablet apps. However, the recently deceased Apple co-founder was also famous for disparaging products right before Apple got into the business or offered a similar product as it did with video iPods, mobile phones, and e-books. So will Apple offer an iPad Mini later this year? It's certain looks more likely in July than it did a few months ago. 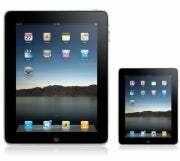 But speculation about a smaller iPad has circulated before, including in 2010 and 2011, and an iPad Mini never appeared following those claims. This time reports about a smaller iPad are also starting to build up. Bloomberg's report follows a similar claim from iMore in May and further iPad Mini rumors may appear the closer we get to October. Given this rumor's past popularity, multiple reports can hardly count as a guarantee we'll see a smaller iPad later this year, but an iPad Mini launch certain feels like a stronger possibility than ever.